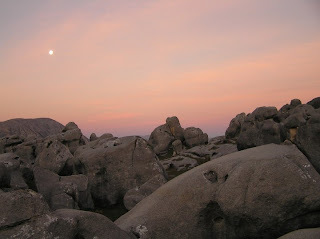 Sunset at Castle Hill (photo by Suz). The brilliant organizers of Credo, my NZ ultimate team, decided we needed a team bonding weekend. Most of the team has played together for years, but there are a few of us that don't know everyone else. The organizers booked a private school's 'cabin' near Castle Hill in Arthur's Pass. This would allow us to do presentations, cook a potluck dinner, and use the outdoors as bonding time. My nemesis. I came back the next day and got farther, but just couldn't solve the puzzle. I was going to head up later on Friday, but found out that Suz and Arnoud were heading up earlier to go bouldering at Castle Hill. I had only driven by Castle Hill before and was amazed by it. I was also fresh off my great climbing experience at Castle Rock so I wanted to get in on the action. Arnoud found some beginner climbs for me to work on and I got a few. However, the climb in the photo above, rated V2 I think, got me. I kept us there past sunset trying to get it because I was so close. I came away with the start of a number of blisters on my fingers and a lot of achy muscles. 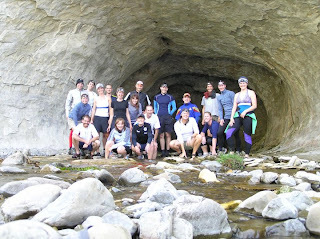 The team, just before we started the cave stream hike (photo by Suz). The team slowly trickled in through out the night. Some got stuck on the gravel drive way in and needed a little help. Some didn't make it until morning because their flights were delayed. Once we gathered, we talked about the direction and desires of the team. Afterward, we got to head outside for outdoor adventures. Our first activity was to hike through a cave stream. Mike added a great twist by having us find a hidden object in the cave with our name on it. Just before we started, he ran around and tossed ping pong balls into the stream that we found as we came through. It was a great twist on a simple hike. Inside the cave (photo by Suz). As soon as we entered the cave, most of us got wet. A few people dodged it for a few steps but sooner or later we were all walking in the stream. It was just easier, if not a little colder. However, the cold was a welcome relief on a hot day. 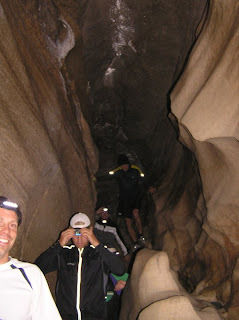 Once we were in the cave, about half of us had head lamps so we could see where we were going. I think they were best used to make sure you didn't hit your head. It was still hard to see your feet through the water. We slowly picked our way upstream entertaining ourselves as we went. I think my favorite part was when we turned off the head lamps and walked via glow stick. You also got to enjoy the cave as it is naturally. I think you could probably get through the cave in the dark, you would just bump your head a few more times and possibly miss the ladder to get out at the end. The biggest amazement of all is that when I looked it up later, I found out the cave is only 600m long!! It took 60-90 minutes to get through so I thought it was much longer. Instead, we were just slow or maybe taking our time and enjoying ourselves. Castle Hill in Arthur's Pass. From on top of one of the boulders at Castle Hill. After caving, some people went back to the cabin to nap and sun bathe. Some of us went to Castle Hill to try bouldering. I went back for more bouldering. I didn't do nearly as well as the night before. I think it was my muscles were still tired, but it was still a treat. Arnie shows how easy it is to run up impossible climbs. One of the weirdest things about bouldering is that you can watch someone else get up right up a rock with minimal effort and try the same thing, but fail. Unless you trust your body or the required move, it can be really hard. Sometimes you just don't have the strength or flexibility to make it happen, but a lot of times it is mental. There were so many puzzles that I saw Arnoud do easily, that I just couldn't solve. I'd try the same basic actions, but didn't trust myself to put it all together. I think my favorite one was when Arnoud did a rock I'd never even try because he had to be leaning backwards to climb up and over the lip (pictured below). Arnie goes up and over the lip from the previous picture. Team dinner (photo by Davon). After everyone's afternoon shenanigans, we settled in to make a team dinner which was delicious. Then, we moved on to the team Oscars. Everyone ended up with an award of some sort. I won most likely to destroy cleats, but was also nominated for looking like a hobo with my unruly beard. The beard is now gone. I'll have to stick to blowing out cleats. Not traversing a mop handle. When the awards were done, every one did whatever they wanted. Penny came up with a bunch of party tricks to make our lives difficult. It all started when Arnoud tried to traverse a table with out touching the floor. 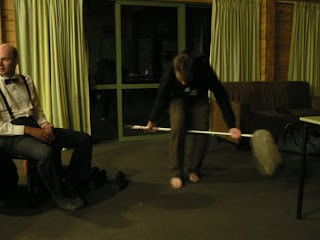 We tried to traverse a mop, which my inflexible wrists would not let me do. We rested coins on the lip of a glass and tried to blow them over the entire glass. We also tried Eskimo jumping (keeping your fingers wrapped around your big toes the whole time) over a piece of paper. That was a failure for everyone. There were a few others, but I can't remember them. Finally, we went out to see the stars. I saw one of the longest shooting stars in my life. One of our captains, Mike, layouts for the catch. In the morning, we woke up, cleaned up, and darted back to Christchurch for our biweekly game to get ready for Worlds. I played much better than the week before. Two major errors, one mental on the choice of a throw and one execution on a dump throw, instead of the four or five from the last game. I'm glad to finally be getting chemistry with the team again. As a team, we are starting to clean things up as well, especially with the handlers. Genial post and this fill someone in on helped me alot in my college assignement. Thanks you on your information.